"But art is also a world with its own laws, whether they underlie a painting of realistic or abstract forms... to create new universes within these laws and to fill them with experiences of our life is our task... when they convincingly reflect the wisdom or struggle of the soul, a work of art is born." Drewes began his artistic career after his military duties in World War I when he was 22 years old. During this period he studied with prominent figures such as Wassily Kandinsky, Johannes Itten, and Paul Klee. While attending the Bauhaus School in Weimer, Germany, Drewes became close friends with Lyonel Feininger, Moholy-Nagy, and Josef Albers; all of which later proved to be lucrative for his career. During this period of the Bauhaus when they were located in Weimar, there was a high stress on avant-garde experimentation. Drewes was torn between the worlds of representational structure and abstract organization. This struggle remained prominent in his mind and is reflected in the stylistic fluctuation from representational to geometric abstraction. In 1923, Drewes left Bauhaus and traveled Europe, South and Central America, and Asia. Perhaps, this was an attempt to escape the turmoil that was bubbling to the surface in Europe. After his world-traveling adventure, Werner later returns to Bauhaus to find the educational regiment has changed, and with distaste of this new structure, he relocated to New York. As a professor for The Brooklyn Museum School and Columbia University, Werner Drewes encouraged and inspired many future generations of artists. He, along with numerous well-known artists, found the American Abstract Artists in 1937. During this time his style of painting is highly distinguishable, he concentrated on abstract geometric landscapes and architectural abstraction. He received an award in 1939 from the Museum of Modern Art during an exhibition there. In the 1940s, Drewes taught at the Moholy-Nagy Institute of Design in Chicago, Illinois. A year later he relocated to St. Louis, Missouri and would remain teaching at the School of Fine Art at Washington University for over 20 years. Drewes' main oeuvre was printmaking and abstraction. 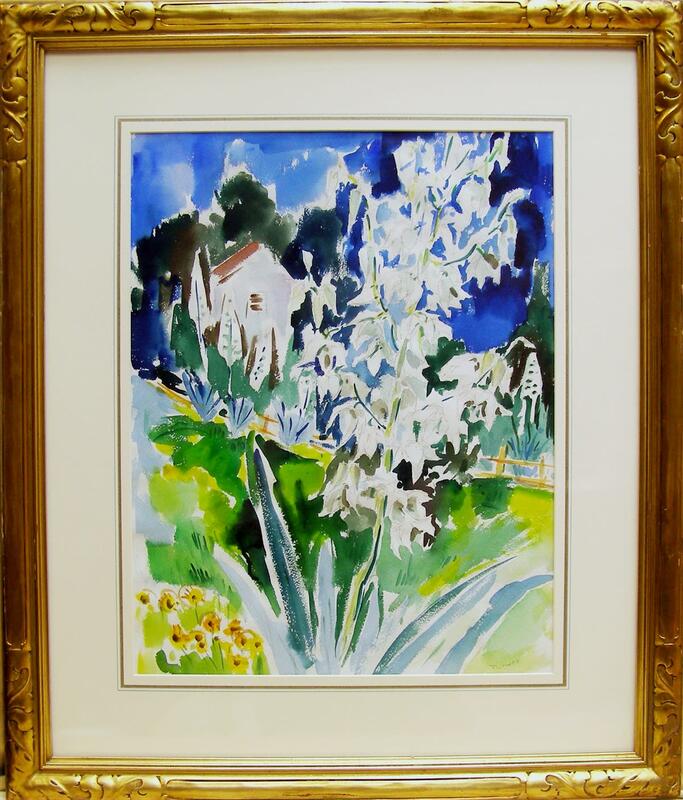 Yucca Growing in the Garden is from the period of his work that is characterized by vibrantly colored landscape with a strong sense of light. In 1962 Drewes moves to Point Pleasant, Pennsylvania which is on the banks of the Delaware River. The piece Yucca Growing in the Garden was possibly created around this period of his life. 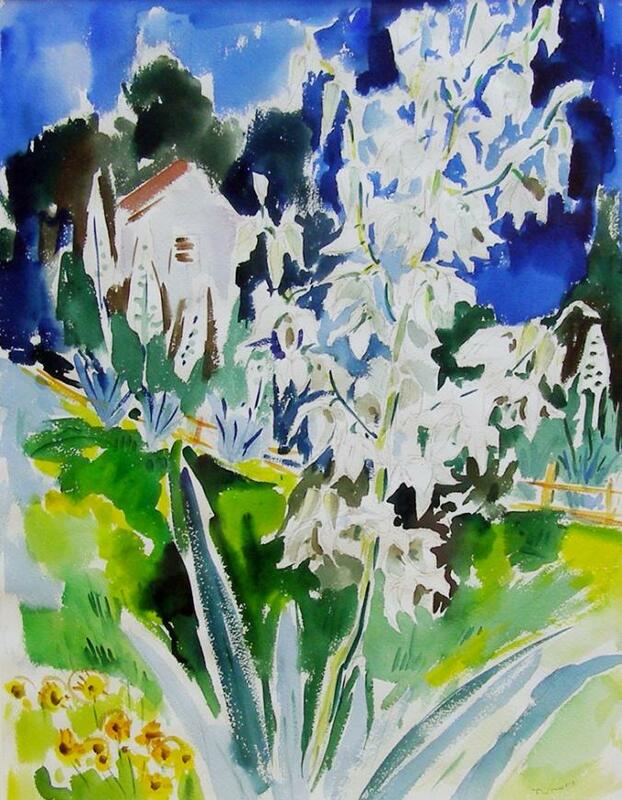 The yucca flower in the watercolor has been identified as a Yucca Filamentosa. The drawing is not just about the flower entirely, or the figures in the work; there is a focus on the formal element of color and color theory in this work on paper. Also, there is the attempt to blend both the flower and background together where there becomes no difference between the two picture planes. This technique is derivative from the colorists teaching of Johannes Itten and also of his good friend, Josef Albers. By blurring the differences of the background and foreground, the world around Drewes becomes abstract. He is reconstructing his universal perspective to create Yucca Growing in the Garden.